Solaris is many things, but it is most of all the greatest answer film in all of cinematic history. By 1968, Andrei Tarkovsky had already earned the cinema’s eternal respect and humility by debuting as a major world director with the greatest film ever released about the nature of spirituality as it exists in relation to humanity, as it is felt in the senses. He clearly saw the light in Andrei Rublev, but it asked him not to falter or recede, but to continue to preach his gospel. Eying Stanley Kubrick’s eternally cryptic, disquieting, rigidly and pointedly mechanical work of genius, 2001: A Space Odyssey, Tarkovsky plainly grasped the film as a battle cry, as I certainly am not the first to notice. It was Western, for one, and scripturally infested in machines and production, and Tarkovsky was so fundamentally a bleeding-heart humanist that even the early Soviet focus on labor and metal had no use for him, let alone a Western focus on materialism. With 2001 shaking its head at humanity’s ambition and positing a certain greater humanity found in space we could never hope to understand or know, Tarkovsky no doubt refuted the ghostly specter and vast, echoing void of inhuman spaces in Kubrick’s film. Tarkovsky, essentially, felt a calling to bring out the guiding light for humanity once again. Admittedly, his definition of light is not inherently less enigmatic or abstruse than Kubrick’s, but it is, ultimately, warmer, which for Tarkovsky, was all that mattered. Solaris is a warm specter of a film than, giving gifts and shedding light on humanity’s woes with not one ounce of anything less than compassion for any single human being, contrasted with Kubrick’s human-hating cinematic ghouls. Solaris is as impeccable a work of craft as 2001, but although you might not realize it at first glance, it is so to a diametrically opposite end. 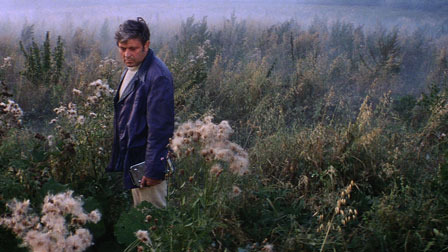 Tarkovsky wanders the halls of humanity’s making as Kubrick did, but the first half of his film makes it clear that he would rather rest and ponder among the flowers and in the fields. Pointedly, anything resembling hard science fiction is as far from the mind’s eye of the first half of Solaris as humanly possibly. Tarkovsky demands that we enjoy the company of natural spaces, rendered with lushly haunting and impossibly mournful, moving hues of yellow and gold by Tarkovsky and cinematographer Vadim Yusov. Through this lens, nature is the realm of godlike calmness and ethereal sumptuousness, an aural and visual sensational palace that costs nothing and asks nothing, but simply gives and sits by and allows humans to waltz in and enjoy its forgiving, equalizing spaces. Nature has never before or after felt so welcoming in cinema. A place that no one would want to leave, and yet Kris Kelvin (Donatas Banionis) must. We wait with him as he sips his last swigs of family memories, going so far as to eviscerate his memories in a fire in a deliberate bid to disconnect from the harsh truth of what he is never likely to see again. He must venture out into another great void, that of space, to reconnect with a space team studying an oceanic planet far away, called Solaris, to search for signs of life. He must leave Earth behind. Solaris isn’t an anti-science motion picture so much as it is a cautionary tale with a mind struggling to remember why science serves a human purpose in the first place. Tarkovsky explores, as much as Kubrick did, the harsh, monochromatically regular and metronomic husks of the space station near Solaris with a roving camera searching for life. A life it doesn’t find in the space station, at least initially, for the previous researchers, although mostly alive and physically well, do not connect with Kris, or even seem to care about the arrival of a new human being with tales of Earth. They wallow and moan and seem violently distracted, and then a memory of Kris’ wife, who had committed suicide, arrives. And in her, the film finds possibility in exploration and in the future. But what is she? A humanoid, for one, who looks and acts exactly like Kris’ wife, but what else? A harsh reminder of his failings, or simply his losses? A chance anew? Well, Tarkovsky is Tarkovsky, so his humans worry and try to “discover” the truth of this figure, postulating until postulating becomes proselytizing and they can’t but give in to Solaris’ mysteries. They have theories, no doubt, but Tarkovsky isn’t swooned by the theories so much as the emotional possibility of Kris now encountering a memory of his former life. It turns out the ex-wife is Kris’ memories given flesh and blood, a being arriving with no ill will or desire to harm but simply a human desire to know. Kris shuns her, but learns to re-open himself to his past, finding in the exploration of space a possibility of humanity, a possibility of redefining himself through not only humanity’s future exploits but its past ones. She is a literal idea, a tacit reflection of sci-fi’s relentless emphasis on ideas, sometimes at the expense of humanity. She is Tarkovsky’s view of the genre, essentially, and his statement of purpose: a floating memory, a void, turned whole and human and physical and tactile, just as his film is the abstracted but still tactile humanization of the floating, often human-apathetic, void of the science fiction genre. Thus, Solaris is a science fiction story less than it is a fable or a fantasy, as it reveals in its final moments when Kris is gifted and cursed with the possibility of venturing to Solaris where he now knows his past memories, all the things he has lost, will be alive and well for the experiencing. It is a tale of human interest filtered through space ships, yes, but Tarkovsky is less invested in what those spaces technically are than in what they represent and how they feel. A space ship, to him, is a possibility but also a strain and a liar, a cold, merciless figure that can either save humanity or strip it bare. A space station is an enigma, essentially, an inner space of the human mind literally transformed into a physical entity, and it is the center of Tarkovsky’s speculative reminiscence and thesis on the idea of science fiction. More than any director, he ties the two words, science and fiction, together, positing that science is a place for human fictions and spiritualities to come alive yet again, but he doesn’t ever demonize science for its fiction. Rather, he sees in fiction a necessity and a hope to better ourselves, to discover the majesty of innocence, to confront the sinister misuses in the ego of the human mind. For him, the memory of Kris’ wife is naught but another space ship, another human-built manifestation of our unending desire to discover ourselves. If so many science fiction films tackle the possibility of “fake life” with disdain, Tarkovsky has the clarity to ask the more difficult, more silent question about the materialization of Kris’ ex-wife: if “fake” life, created from memories, feels real, and serves a human need for emotional sanctuary, does it matter if it is fake? And what, for that matter, do we even mean to call it fake? What do we know of the experience of “being” and “existence” to validly determine whether an object that for all intents and purposes is subjectively life, but is scientifically inorganic, should be considered lie? How do we determine what “being” is? Is this entity a lie even if it feels true in the moment? All of these aforementioned questions Tarkovsky asks, not with grandstanding court room dialogues and arguments, but with simple, calm, visual queries that beg us to ponder the alien nature of Kris’ materialized memories. But he also allows for the genuine emotional experiences those memories, now in human form, might feel. He allows for, and welcomes, their “realness” in the moment. Tarkovsky’s great innovation is to use every ounce of his visionary camera to shift back from science fiction’s endless meditation on the technical aspects – “How can a memory constitute a physical form?” – and into its romantic, sensational open spaces to carve out human problems and solutions. He isn’t interested in how this story could make sense, but in the simple fact that it can help someone cope, and that it feels present in the moment. It is science, in essence, without restrictions, a thesis on why we need science as a possibility for the spiritual and human constitution to understand ourselves, but also a realization that experiential feeling and stopping to simply enjoy without question or provocation, if lost, dooms science to mechanical innovation only . Not a study in how science works, as so many science films tend to be, but a study in what it means as a drawing board for us to discover ourselves. Fittingly, for every minute of its nearly three hour existence, Solaris seems like discovering what cinema is, what it has been, and what it can be. Discovering it as a science, but also a craft and an art, as well as an idea and an expressive friend. Sure, Solaris was adapted from a novel, but it a vividly, unquestionably cinematic lexicon for understanding the world, and the self. Tarkovsky always felt purpose in his films, but like all visionary works of cinema, the purpose was not simply to say something, but to say it a certain way. A cinematic way, a way only a camera lens and a dreamer could see. Solaris could not work in any other medium, for everything it postulates and debates with, it does so only through the rhythms and vernacular of cinema. For Tarkovsky, cinema was a means of therapy, a means of becoming himself, a means of humanity, and for Tarkovsky, it could only have ever been cinema. This entry was posted in Review, Un-Cannes-y Valley on September 5, 2015 by jakewalters98.